El grupo debe respetar las normas de convivencia del Hostal durante su permanencia. 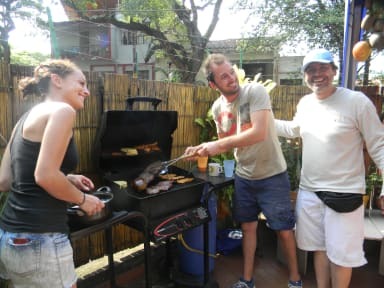 At our hostel you can take Salsa classes, Spanish classes or walk to the nearest school. You will also have tourist and cultural information you need to enjoy this wonderful city, its events, while exploring the beautiful 'Valle del Cauca' region of Colombia. We are located in a safe San Fernando neighborhood, with beautiful trees, parks and neo-colonial architecture from the 1930's. 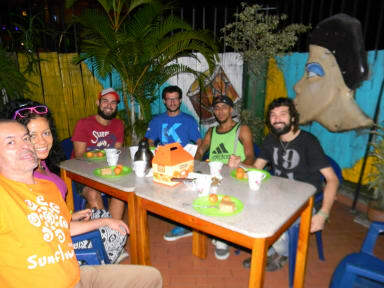 Within 3 minutes walking distance you will be in Parque del Perro park (named after a dog statue), a trendy, happening area with 2 supermarkets, ATMs, many restaurants, bars, cafes and authentic rumba and salsa Colombian night life. We have a total of 24 beds with selection of dormitory and private rooms. All come with a fan, comfortable bed and a security locker. BREAKFAST IS OPTIONAL. We have tea and coffee available all day.